Oral formulations and suppositories require a medical prescription not repeatable, while the gel formulation does not require a prescription instead. Nimesulide [N-(4-Nitro-2-phenoxyphenyl) methanesulfonamide] is a non-steroidal anti-inflammatory drug (NSAID) which preferentially inhibits the enzyme cyclooxygenase-2 (COX-2) and has better gastro-intestinal tolerability among other NSAIDs in its class. COX-2 enzyme takes part in the synthesis of prostaglandins which are produced in the course of the cascade of the inflammation process and has relation to the pathogenesis of pain, inflammation and fever, while the COX-1 enzyme forms prostaglandins which project the gastro-intestinal mucosal. This molecule refers to the class of sulphonanilides, which is unique among the non-steroidal anti-inflammatory drugs: Nimesulide has analgesic, anti-pyretic and anti-inflammatory activities, it’s indicated as second line treatment for acute pain, symptomatic treatment of painful osteoarthritis and primary dysmenorrhoea. Nimesulide was first marketed in Italy in 1985 and since then has been launched in about 50 countries around the world. The substance is off-patent and for this reason are now available a number of generics containing the same active ingredient marketed by many pharmaceutical companies (Algimesil, Algolider, Efridol, Mesulid, Nimesulene, Remov, etc). The recommended dosage is 200 mg/d and the maximum duration of treatment is 15 days in order to minimise the occurrence of side effects. 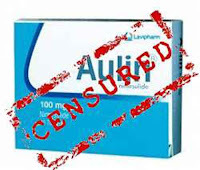 It should be noted that the side effects and contraindications of Aulin are absolutely equivalent to any medication containing Nimesulide. Although Nimesulide is currently approved in 50 countries worldwide, national health authorities of several countries have withdrawn Nimesulide from the market and others have never approved it. On March 2002, Finland suspended the marketing of Nimesulide because of an associated high frequency of hepatotoxicity. On May 2002 the Agencia Española de Medicamentos y Productos Sanitarios (AEMPS, the Spanish medicines agency) establishes a precautionary suspension of the marketing of Nimesulide. In its communication concerning the suspension, AEMPS makes explicit reference to the Finnish decision and reports that the Spanish committee has concluded that Nimesulide is associated with an increased risk of liver injury (both in frequency and severity) than other NSAIDs. The liver toxicity seems to be based on a mechanism of idiosyncratic type, not related to the dose and difficult to predict. On 15 May 2007 also the Irish Medicines Board (IMB, the Irish medicines agency) decided the immediate suspension of the sale, after receiving information from the operating unit of liver transplantation at St. Vincent Hospital University of six patients who required a liver transplant after treatment with Nimesulide. In its communication, the IMB remember that Nimesulide was authorized to trade in Ireland in 1995, and since then had received a total of 53 reports related to adverse reactions in the liver. Of these 53 cases, 9 had evolved into liver failure and 3 had a fatal outcome. The European Commission has posed the question on Nimesulide to the CHMP (Committee on Human Medicinal Products) in order to obtain further updating. Because of clusters of spontaneous reports of suspected hepatotoxicity with Nimesulide, the European Medicines Agency’s Committee on Human Medicinal Products required an epidemiological study of NSAID-exposed acute liver failures leading to transplantation. Waiting for the EC to adopt a final decision binding for all European countries, the Italian Medicines Agency applied restrictions to the dispensation of Nimesulide in order to discourage misuse and abuse of the substance. Information concerning the risk of Nimesulide-associated hepatotoxicity and the development of this evaluation were made public through AIFA website and publications. In February 2010, the AIFA issues a statement directed to healthcare professionals about the risk of liver damage associated with the use of Nimesulide. In the press for the first time Nimesulide is defined as a second-line treatment, that should be used after a careful assessment of the individual patient's overall risks. They repeated the other recommendations regarding the duration of treatment and the risks of the concomitant use of hepatotoxic drugs. In February 2012, always AIFA, with special note given to doctors, introduces further restrictions on the therapeutic indications of Nimesulide, believing that the benefit / risk profile of Nimesulide is not more favorable in the chronic use reserved for "symptomatic treatment of painful osteoarthritis”. This indication, involving a long-term use and therefore an increased risk of liver damage, is eliminated. The use of this medicine in Italy is therefore limited exclusively to acute conditions, namely the treatment of acute pain and primary dysmenorrhea. Environmental factors, alcohol abuse, viral infections and metabolic factors coexist with DILI (drug-induced liver injury) constituting confounding factors, but it was observed that Nimesulide still showed both a slightly higher incidence of liver damage and a higher hospitalization rate than that observed with the other NSAIDs (33 per 100 000 patient-years vs 22 per 100 000 patient-years respectively). The European pharmacovigilance database shows that Nimesulide is associated with more cases of severe liver damage than other NSAIDs, as well as more cases of liver damage than with other COX-2 inhibitors; fatal cases remain rare. Nimesulide-induced hepatic toxicity is unpredictable and the intensity of symptomatology is variable. In the vast majority of cases of liver damage, the dose of Nimesulide used was that recommended in the summary of product characteristics. The current policy concerning the use of NSAIDs recommends that patients should take “the lowest effective dose for the shortest duration” needed to control symptoms: EMEA (European Medicines Evaluation Agency) currently recommends a restricted length of treatment (15 days) and a maximal drug dosage (200 mg/d) for Nimesulide therapy, which in addition should be avoided in children. Although Nimesulide bears a good gastro-intestinal tolerance, its hepatotoxicity shows a wide spectrum of liver damage including acute hepatitis, cholestasis, mixed forms, massive and submassive hepatic necrosis. These effects are usually reversible on discontinuation of the drug, but occasionally can progress to fatal hepatic failure. The main clinical symptoms are jaundice, malaise and pruritus; transaminases level higher than three times the upper limit of normal is generally used as a marker of significant hepatocellular injury. Inquiring about Nimesulide intake should be incorporated into standard anamnesis of liver disease, especially when acute liver damage is being investigated. Similar to other drugs causing idiosyncratic hepatotoxicity, both the molecule and the patient contribute to the hazard. The mechanism of liver injury has been attributed to the unique chemical structure of the sulphonanilides class of NSAIDs; the weakly acidic sulfonanilide drug undergoes bioreductive metabolism of the nitroarene group to reactive intermediates that have been implicated in oxidative stress, covalent binding, and mitochondrial injury. The molecular mechanisms underlying this toxicity have been partially elucidated: experimental evidence suggests that they include increased concentration of the drugs in the hepatobiliary compartment, formation of reactive metabolites that covalently modify proteins and produce oxidative stress, and mitochondrial damage. Nimesulide in overdose, as commonly encountered during the treatment of several pathological conditions (like ankylosis, osteoarthritis, etc) induces severe hepatotoxicity, which decreases benefit to risk ratio for this widely accepted and popular drug. The mechanism underlying this hepatotoxicity is mitochondria-mediated as Nimesulide is found to accelerate ROS production, thereby ensuing oxidative stress. Mitochondria play a central role in regulating cell survival and death signaling in liver cells. Rising evidences suggest that apoptotic pathways converge at the mitochondria, where signalling is initiated through a series of molecular events culminating in the release of death factors. This triggers either caspase-dependent or independent apoptosis. Mitochondrial apoptotic proteins like cytochrome c (Cyt c) cause caspase-dependent cell death and trigger caspase-9 activation. Nimesulide was found to cause the release of Cyt c from mitochondria and the subsequently cleavage of pro-caspase-9/-3 into active caspases. Apoptosis-inducing factor (AIF) and endonuclease G (EndoG), along with other important mitochondrial proapoptotic proteins, are reported to translocate to the nucleus and cause DNA fragmentation during mitochondria mediated caspase-independent cell death. Release of these mitochondrial death effectors is tightly regulated by the Bcl-2 family proteins during membrane permeability transition (MPT); it’s clearly a redox sensitive process. This phenomenon is also sensitive to glutathione (GSH) depletion in a synchronized manner with oxidative stress and calcium overload. Mitochondrial activity can be checked by various techniques including measurement of electron flow, NADH level, important for electron transport chain or by observing mitochondrial depolarization which is a characteristic feature in mitochondrial dysfunction and loss of activity. It is therefore to be expected that mitochondrial impairment could be a relevant mechanism of drug-induced toxicity, particularly in liver, where most of the drugs get metabolized. Hepatotoxicity due to Nimesulide is evident from high levels of bilirubin and aminotransferases (SGPT, SGOT) and histo-pathological changes. Antioxidants and key redox enzymes result altered significantly as assessed by their mRNA expression and enzyme activities. Redox disequilibrium along with oxidative stress is evident from decreased NADH and GSH levels (56% and 74% respectively), increased superoxide and secondary ROS/RNS generation along with oxidative damage to cellular macromolecules. Nimesulide reduces mitochondrial activity, depolarizes mitochondria and causes membrane permeability transition (MPT) followed by release of apoptotic proteins (AIF; apoptosis inducing factor, EndoG; endonuclease G, and Cyto c; cytochrome c). It also significantly activates caspase-9 and caspase-3 and increases oxidative DNA damage. Nimesulide-induced apoptosis is further confirmed by DNA fragmentation and chromatin condensation. Its exposure increases intracellular ROS, translocation of Bax and Bcl2 followed by mitochondrial depolarization and cytochrome c (Cyt c) release along with caspase-9/-3 activity confirming involvement of mitochondria in Nimesulide induced apoptosis. It is known that during mitochondria dependent apoptosis, procaspase-9 is released from mitochondria to cytosol, auto-activates and forms apoptosome along with dATP, ApoAF-1 and Cyt c. Apoptosome finally cleaves and activates procaspase-3 into executioner caspase-3 which further triggers DNA damage during apoptosis. Therefore membrane depolarization of mitochondria, expression of Bax, Bcl2, externalization of phosphatidyl serine and activation of caspases are critical pro-apoptotic events induced in hepatocytes by this substance. In conclusion, Nimesulide caused significant decrease in cellular antioxidants and increased ROS/RNS generation which in turn caused oxidative stress. Compromised antioxidant status enhanced oxidative stress that facilitated depolarization of mitochondria and altered its functions. Dysfunction in mitochondria further increased ROS/RNS generation, which creates a vicious cycle. Enhanced oxidative stress also damaged macromolecular network, increased MPT followed by the release of mitochondrial cell death proteins, like AIF, EndoG, Cyt c and activated caspases (caspase-9 and caspase-3) culminating into DNA damage and cell death during hepatotoxicity. These observations regarding Nimesulide-induced oxidant-antioxidant disequilibrium and mitochondrial dysfunction may be a step in the direction of establishing some relation between oxidative stress at the sub-cellular level and drug induced hepatotoxicity.